Providing audio narratives in a very unique display setting, Audio Spotlight directional sound technology is at the heart of an inspiring exhibit in Minnesota called the Wall of Honor and Museum. 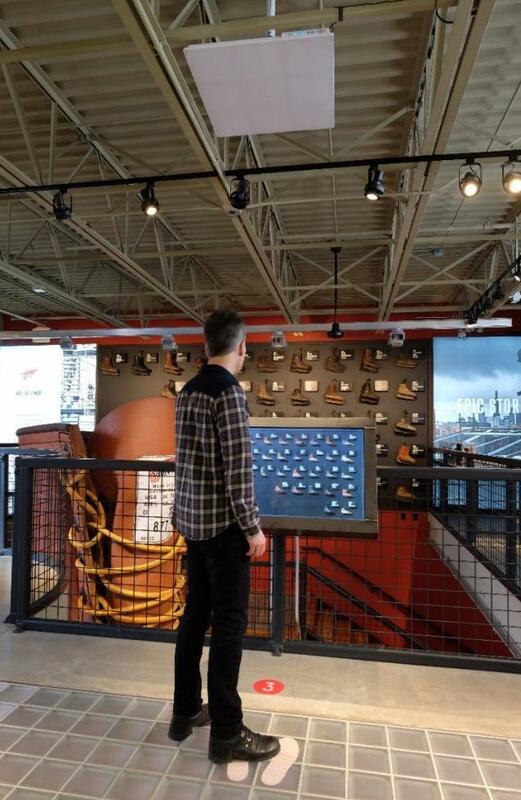 Red Wing Shoe company approached Audio Spotlight integrator Star Exhibits to create the museum as a way to tell the remarkable stories customers had about the work boots they wear everyday. Star Exhibits utilized Holosonics' directional speakers to broadcast the personal stories behind the boots on display in the shoe maker's flagship store in Red Wing, MN. The stories behind the displays are varied, including one lineman's tale of how his boot saved his foot from potential amputation after an accident involving a six-ton wire reel. Another display depicts how a single pair of Red Wing boots carried a worker through 27 years as a North American logger. And one of the most compelling displays focuses on a pair of boots that were worn by a rescuer at Ground Zero in New York City in the aftermath of the September 11, 2001 terror attacks. The construction worker's boots were credited with saving the man from being electrocuted when he inadvertently stepped on a live wire while assisting a fellow rescuer who was overcome by smoke inhalation. These are just a few examples of the Wall of Honor's many stories that are conveyed through a compelling combination of visual displays and directional sound technology. "For exhibit sound, Audio Spotlight is an innovative and powerful tool. Our clients at Red Wing were very happy with the overall function and directivity of the speakers," said Greg Stanek, Design Developer at Star Exhibits. Photos provided by Jim Larkin Photography, courtesy of Star Exhibits.